Today’s missive is regarding reporting of a new poll that I came across on Moneynews.com. The headline reads “Poll: Most Americans Want to Tax Rich to Balance Budget” and is dated Monday Jan 3, 2011. According to a Vanity Fair/ 60 Minutes poll some 60% of Americans want to raise taxes on the rich to balance the budget. Another 20% of those polled want to cut defense spending and about 5% each want to cut Medicare and Social Security. What the average American does not understand is that there is no way we can balance the budget by taxing everyone in the US even at a 100% rate let alone trying to shift all the burden to the rich. People must learn that we have a spending problem not a revenue problem. The basic problem dear reader as I am sure you are aware is that the government continues to spend at a far greater rate than the amount of revenue it collects. 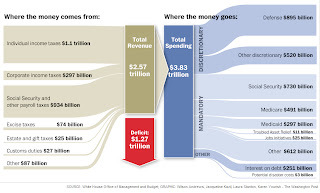 In 2010 the government spent in excess of a trillion dollars more than it took in, assuming that you don’t count unfunded liabilities and off balance sheet spending such as Obama’s war in Afghanistan or the continuation of the Bush Iraq blunder. People are deluding themselves it they believe that this clusterF#ck we call a government budget and deficit can ever be rectified with tax hikes on the wealthy. The Washington Post did a great graphic representation of where the government’s funding comes from and where it goes to. The bottom line is that for 2011 the budget proposed was $3.8 Trillion and of this $2.166 Trillion fall in to the mandatory spending category. These categories include Social Security ($730 Billion), Medicare ($491 Billion), Medicaid ($297 Billion), TARP ($11 Billion), Jobs Initiative ($25 Billion) and “Mandatory Other” ($612 Billion). The above figures do not include $251 Billion for the interest on the debt which I would say is mandatory and would raise the outflow figure to $2.417 Trillion; that is unless we are planning to default. 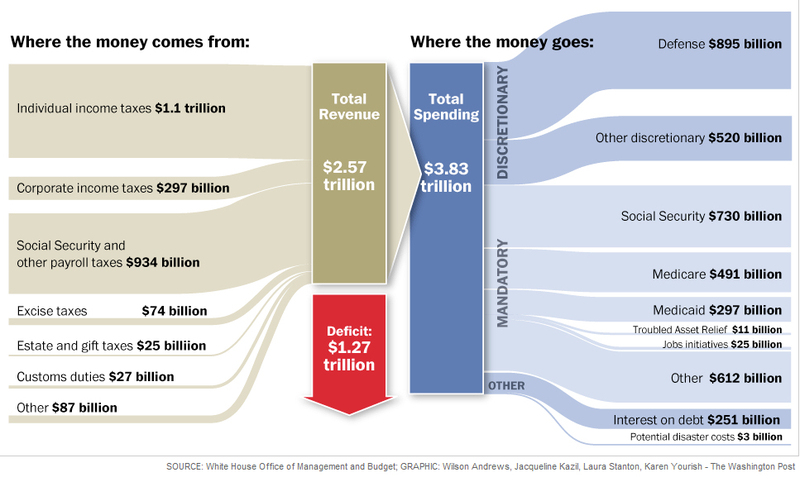 You can plainly see that if we as a country decided to cut every single department and government job or entity and kept only the mandatory spending we could theoretically have a surplus of about $100 Billion. This draconian measure would mean no Supreme or Appellate Courts, Army Corps of Engineers, Department of Commerce, Legislature (Congress or Senate), President, NASA, Department of Interior Department of State, EPA, Department of Energy, VA, Department of Education, Department of Agriculture, International Aid, Housing and Urban Development, and the list goes on. Of course we would still have the Department of Defense and our modern day “Gestapo” the Department of Homeland Security. Of course none of the figures bandied about in the mainstream media takes in to account the unfunded liabilities that are currently projected to be north of $100 Trillion. Once again there is no way that we can ever pay this back and surely not by raising taxes solely on the rich. The government takes in about $2.57 Trillion in revenues of which $1.1 Trillion is income taxes. The top 1% of taxpayers account for approximately 50% of all taxes or $550 Billion. In theory if you raised the tax rate on the top payers to 70% you could collect $1.1 Trillion just from the rich. Ah, dear reader it is not that simple. The more that you raise tax rates does not necessarily lead to equal increases in tax collection. There have been many studies that have revealed that once a tax rate reaches a tipping point that people consider unfair inevitably tax collections drop. For example, in the past when the capital gains rates have been cut we saw more investment and government revenues soared. Conversely a rise in the capital gains rate causes a slowdown in investment and a reduction in government revenues. To put it simply when the rate is high people tend to take more time to realize their gains and in turn the government collects less. When rates are low people tend to realize gains at a faster pace and the government gets more pieces of the pie so revenues rise. A balance needs to be struck with all tax rates since if they are too low then the government loses out while the worker and investor tend to win. If the rates are too high the economy and workers suffer and again the government loses out as the economy declines or is stagnant. We need the goldilocks rate and governments should learn to live within their means as dictated by that rate not vice versa. People who are rich will either find a way to pay less in taxes, reduce their income by closing businesses or reducing the amount they work. The actions of the people that tend to fall in to the rich category do affect the economy as they will hunker down and buy less, reduce workforces, underreport or hide income, and not invest in growing business that bolsters the economy. You see dear reader very high tax rates provide a disincentive for people to work as well as an incentive for people to protect their assets. Why on earth would you go out and work harder to make more money knowing that the government will take an ever increasing piece of your pie if you are successful. The problem of the debt and deficit is currently playing around the world like a bad film in multiplexes everywhere you look. The problem is going to come home to the US and we will have to deal with these issues. I believe it will take a crisis before real action is taken. We are not at the crisis point yet as evidenced by the inaction and failure to agree between parties on the deficit committee set up by Obama to make recommendations on how to deal with the deficit. There will come a time when we will have to make hard choices and items that are sacred cows will have to be touched, but we are not there yet as our hand is not being forced. Unfortunately the US may be “too big to fail” but the real problem is the US is “to big to bail(out)”. Really dear reader who could afford to bail us out? Germany? China? There is no state or group of states that could float us out of the current quagmire period! At some point we as a nation are going to have to take a surgical scalpel and cut the waste and bloat from the Federal Government. We are going to have to change the mindset of people and make them more responsible for themselves as the government cannot afford to take care of everybody. We will have to change laws that promote government and government waste. We will have to simplify the tax code and reduce regulations, but all of this has to wait for the crisis. Yes the US is the richest most powerful country the world has ever known but to quote Dirty Harry from Magnum Force (1973) “A man’s got to know his limitations” or in this case it is the government. The entitlement mentality is what is killing our nation and sapping the entrepreneurial spirit that grew it to the stature it once had. The future is going to have lots of choices especially regarding the debt and entitlements. I can see a day when our government is forced in to means testing for social security and just outright defaults on debt that is not geopolitically sensitive. The day debt/budget reckoning is coming but in the meantime politicians are trying every power grab they can as is the hallmark of a political regime in decline (IE Homeland Security looking to set up at hotels and malls…etc..). I am sorry dear reader if these thoughts are not mainstream and or unpleasant but they are reality. Part of why I write this blog is to alert people to things that I see occurring so that they can be aware and prepare as they see fit. These are the reasons that I have advocated accumulating precious metals as an insurance policy more than a get rich scheme. I am aware that the precious metals are getting hit today but I am unconcerned about these day to day swings as the trend is still up. Additionally, today is options expiration on the COMEX so the “big boys“ are using today as an opportunity to smash the price to relive some of their short losses. There are many that disagree with or don’t believe in the protection of precious metals and I have heard them all but history will rhyme on the side of real money once again to paraphrase Mark Twain. So dear reader, now that I have bored you with why raising taxes on the rich will not solve the problem I want to look at the poll itself. The poll was conducted by CBS News and is a random sample of 1,067 adults nationwide conducted by telephone. The poll also claims to have a 3% +/- sampling error rate. In my opinion this poll is useless and just geared for CBS news to help the Obama administration to try and make the Republicans look bad. It is no secret that the mainstream media has a bias toward the left and would favor higher taxes, which is also what Obama and the Democrats perennially want. The problem with this poll is that it is just sensational journalism at best. To begin with the sample size is too small at only 1067 people. I could over look the sample size if the margin of error were not so miniscule. The thing that makes the poll irrelevant and sensational is who and how they polled. The poll does not tell you how they phrased the questions, and in this way you cannot tell if they were leading the person to a specific answer. Of course the key item that is not being even remotely mentioned is that this was a random survey of Americans or at least we think they are citizens, for all we know there could have been a significant proportion of illegals. Even putting aside the citizenship status question we do not know how many of these people are voters and or likely voters because they don’t differentiate. You need to get a sampling of voters as that is who the government is supposedly working for. Sure if you call random people who are not even voters chances are that they are uninformed at best and could be easily swayed by the questioner. Furthermore, you don’t know any of the socioeconomics of those polled. For all we know the people polled have no skin in the game as they may not pay taxes so what do they care if someone else’s taxes are raised even if it does nothing to solve the problem. I am sure if the pollster asked those individuals that pay taxes if they should raise his or her taxes you could guess what the answer would be, but it is fine as long as it is someone else’s taxes. The biggest issue I have with this sensational piece of statistical trash is that it might actually be used to further an argument to soak the rich. Of course rich is a term loosely defined and depending on where in the country you live rich has different thresholds. As I alluded to before you can soak the rich all you want but all you will be doing is killing the goose that lays the golden eggs since it is the rich that tend to start the businesses that grow and employ people. Fortunately, the Bush tax rates were extended so the economy has one less headwind, but it is the pushing of this agenda for ever higher taxes by the media that worries me. It appears that the media wants to perpetuate the idea that the rich are not paying their fair share where as the problem is government spending and entitlements that rob us all! I know I would like to be rich someday, but if we keep soaking the rich many of us will not have an opportunity to do so or even any opportunity at all. Remember there are many people who believe that a person is rich if you make a $100 more a check than they do.